Things are really moving along here at the house. Over the weekend, I sanded and got one coat of paint on the fireplace in the living room (aka, the living room turned dining room and now turned back into a living room). 😀 Hopefully I’ll have that finished to show you tomorrow. I also bought some dining chairs for the breakfast room at an amazing sale. And because I got them at a steal of a deal, I bought new fabric for them also. 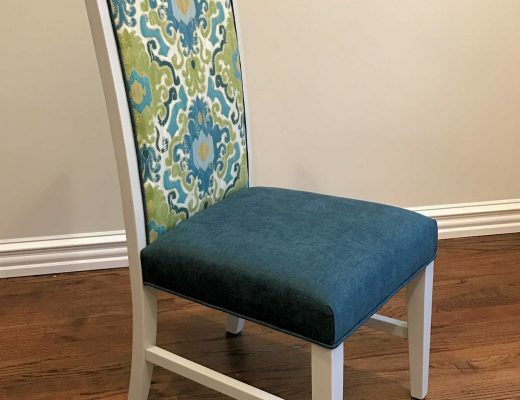 I’ll be painting and reupholstering my brand new chairs, and still end up paying about $20 less per chair than the original non-sale price. I also splurged on a Horchow chandelier for my living room, and it should be here tomorrow. I never shop there because the prices are outrageous, but I found what I love at 40% off + free shipping, which got it down into my “splurge” range (as opposed to their regular “not in a million years” prices). And the chandelier that was in my living room (when it was a dining room) has now been moved into the breakfast room. Phew! Did you follow all that? 😀 Like I said…a lot going on. Oh, and my living room drapery fabric should arrive today! Woohoo! I swear to you, I feel like a thousand pound weight has been lifted off of my shoulders, and things are finally starting to come together. And very easily so. I’m having so much fun now after struggling so much with this house over the last year-and-a-half. Anyway, now that my breakfast room is going to be the only eating area in the house, I want to treat it more like an actual dining room. That means that a big tv hanging on the wall really isn’t the first thing I want people to see when they enter my kitchen and glance into the breakfast room. So I’ve been looking for clever and easily DIYable ways to cover a flat screen tv that’s mounted on a wall. …that are actually hinged together and fold back like shutters. 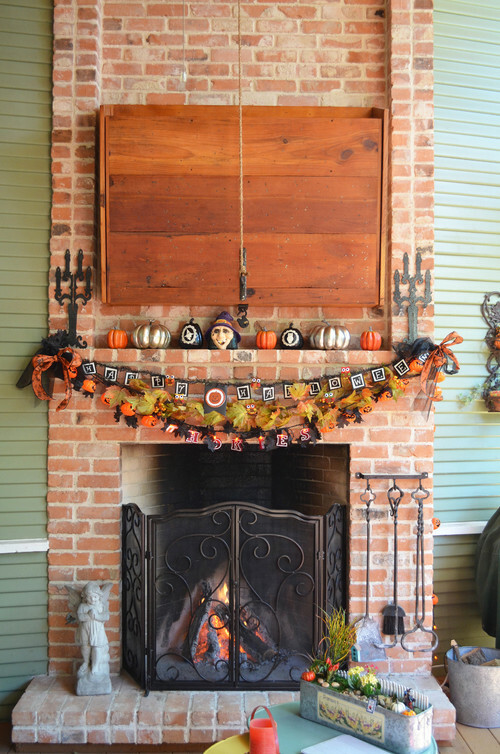 Of course, that tv is set back into the fireplace overmantel so that when the cover is closed, the pictures look like they’re hung directly on the overmantel. My tv will just be hung on a flat wall, so I’ll have to start by building a boxed frame around the tv and then mount the frames on that. It’ll look a bit different, but since any view of the tv/artwork will be from straight on, I think it’ll look just fine. The only side view will be if someone is coming in through the garage door, which no one ever does. Pottery Barn has a couple of tv covers that they sell, but I think both of them would be pretty easy to build. It’s a very similar concept to building a medicine cabinet with a mirror for the bathroom, and you can find lots of plans for those online. 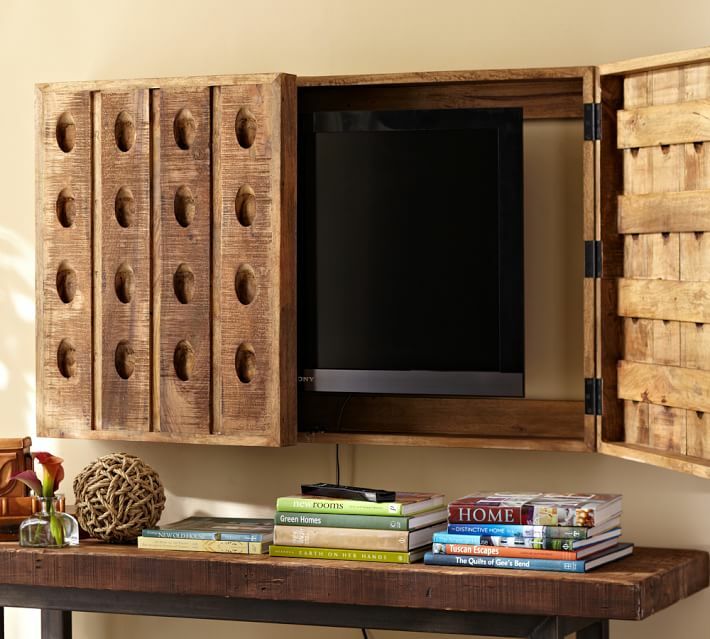 Or you can find something completely unique, like this riddling rack, and use it as decoration for you wall and to cover your tv. The only thing about those previous two ideas is that it really limits what you can set on the table/console below the tv. Since the doors swing out and take up quite a bit of room, you woudn’t be able to set anything tall in front of it or you’d be moving items each time you want to open the tv cover. In fact, that’s something I’ll have to keep in mind for the first design that I want to do as well. This is a brilliant idea. 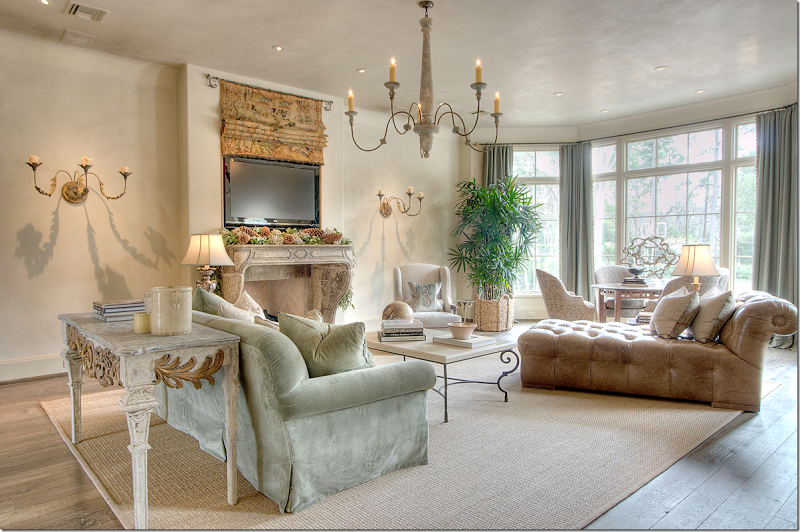 This designer used a tapestry and had it strung like a Roman shade so that it could be raised and lowered to expose or hide the tv. I never would have thought about that, but it’s such a clever idea! 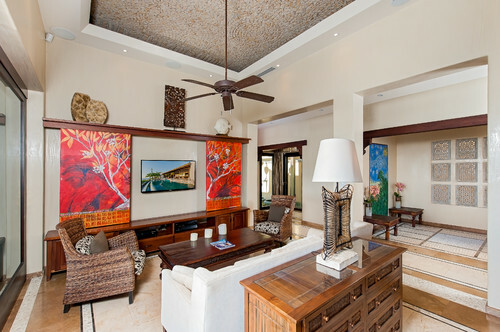 I also like this idea of using a large art piece on two panels that slide apart to reveal the tv. And I especially like how this design hides any roller hardware under a shelf that can also be used to display decorative items. Of course this type of design takes way more room than what I have in my breakfast room. 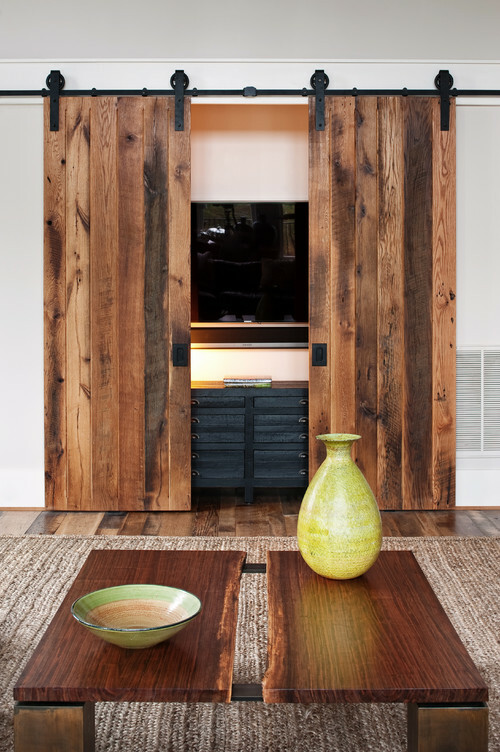 Barn doors also take up quite a bit of room, but they do the job and look great. You can do short ones specifically to hide just a tv. Or you can hide your entire entertainment system behind regular-sized barn doors. And it’s raised and lowered by a handle over on the side. Like I said, probably not practical for most homes, but it’s a fun and quirky idea for wide open lofts or outdoor spaces. So I’m pretty sure I want to build something that looks like the first one with a series of framed pictures on hinges. Now I need to be on the lookout for 12 super cheap but beautiful frames. With all of the holiday sales right now, surely I can find some pretty and reasonably priced frames! Instead of covering and hiding my TV, I decided to frame it! 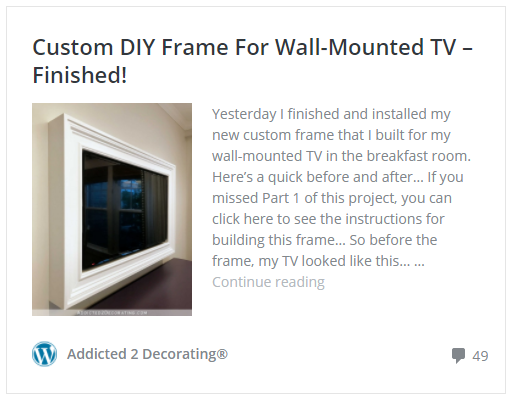 Click here to see that project and my finished framed wall-mounted TV. Oh, what wonderful ideas! Thank you for sharing. These are great ideas! Glad to hear things are still moving along! In my opinion, the ones with the tv mounted on the wall with a box built around them look just like a box built around a tv. They don’t fall under the “clever conceal” category so much as the “obvious conceal” one. I think it would look much better if you could set the tv into the wall, which shouldn’t be too hard if you’re planning to mount it on the garage wall (not sure where it’s going). I really like the clustered frames, but I think it looks best with the low profile. 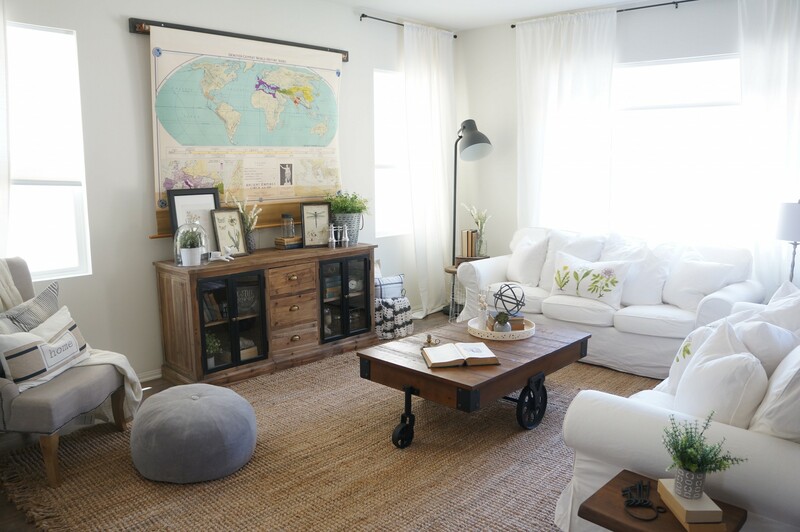 I love the idea of hiding the tv and several of the ideas you displayed are very workable with your plan. Kristi, I have seen the one with the pictures and I love it. I never saw the white barn doors, but that is such a cool idea. I am considering that for my kitchen!!! thank you! We have artwork that is portrayed from our blu-ray player streamed to our tv. When the tv is off it looks like a framed piece of art. I’m in the process of setting my flat screen into a wall of my kitchen. My desire is to frame it so it looks like art. How does the blue ray stream thing work for when the tv is off… I’d love to implement that. Photos of original art that my husband and I love were taken at our favorite museums. They we sized to fit our tv and loaded onto a thumb drive. The thumb drive was inserted into our Blu-ray player. The TV input has to be in the Blu-ray mode. Then you find the devices that your Blu-ray player can manage (ie cds, photos etc.) Click on the thumb drive and the photos will appear. You can scroll thru all of them or choose one to display. This is the way my husband set up our system and there may be other ways to accomplish the same thing. I hope this is helpful. When we have guests, and they see the art scrolling on the TV, they are mesmorized. Love the one you’re thinking about using! I thought of doing something like this, but our tv seems to be on more than off, so I decided to just live with it. :-/ We don’t ave it over the fireplace any more because we found it gave us a pain in the neck. So we bought a media chest from Wayfair, and we love it. As a hint for you, frames are way cheap AFTER Christmas too, because they think you have new photos to frame, and the frame companies new lines start shipping to stores in Jan./Feb. I used to work retail, and we always had resets in the frame dept. in Feb./March. And you may find art suitable on Smithsonian website. Some you can download,or order prints. I’m so glad it’s all finally coming together for you 🙂 I can’t wait to see how it turns out. Those are all great ideas but have one flaw. The tv is placed to high. Your tv should be eye level when you are sitting down. Why not use the first one – I like it so much too!! – and put it on a track like a barn door? Maybe with the hardware working with the pictures in whatever style you decide. A combination of two great ideas, but nothing to have to fold that would preclude placing things on the mantel? Kristi, congratulations on your chandelier. I had to laugh at your Horchow description. I had a “Horchow moment” too, earlier this year. A lamp I had been sighing over for a few years went on sale during one of Horchow’s super sales and so that put the lamp within my splurge range, too. My other “great deal” was last year when I just happen to notice a Maitland-Smith piece I had drooled over was on sale at an incredible price. So I called around my NC contacts, especially one in Hickory that I’ve used several times, and got incredible pricing. Now, if you are familiar with Maitland-Smith companies then you know that their price range is quite high, but then so is their quality. However, for me, they are generally in the “only in my dreams” range so I quickly jumped on that sale of my dream item. Oh, what is the item I bought? It just so happens to be a wall-mounted TV cabinet of a beautiful Chinoiserie design. I don’t have it mounted yet because I knew the bedroom was to be painted and furniture placement might change a bit. The painting is starting tomorrow so I’ll soon be able to actually mount it on the wall. 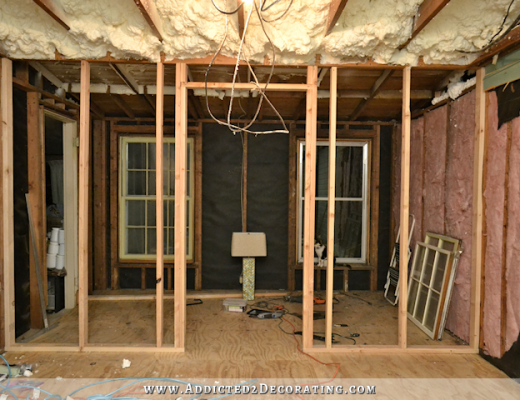 I plan to have the wiring hidden in the wall so that you don’t see cords running everywhere. It’s placement will be over a dresser (mirror-less) which allows me to hang it at the perfect level for viewing comfortably. So, here’s to that perfect, seldom found sale that allows us to make a dream come true. 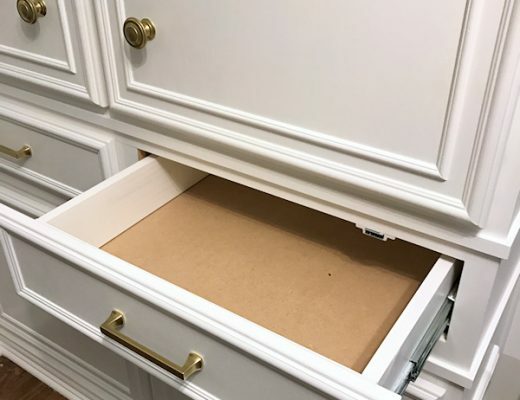 I think you used Pottery Barn’s Vernon bin pulls on some of your cabinetry in your kitchen remodel. I was just doing some Cyber Monday shopping there and noticed, they have them nearly 50% off so I thought I’d let you know in case you wanted to pull them into other areas of your house while they are cheap. 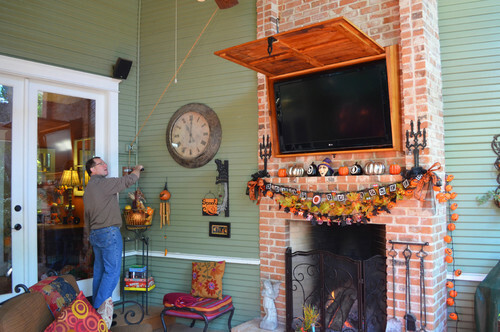 How about one of those lifts that lift the tv out of the chest or whatever piece of furniture. Then when it’s gone it’s gone. 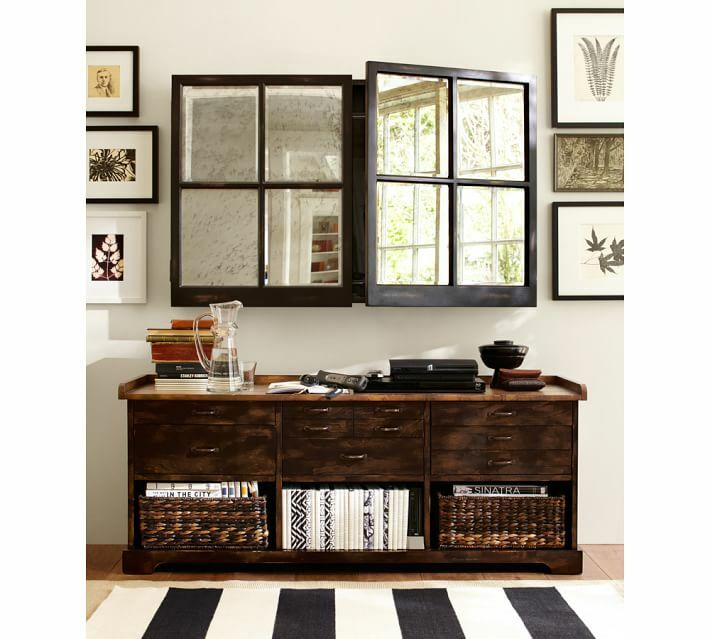 Another idea is using hinged shutters. I guess it would depend on the style of your house as to what would look best. I especially like the paned doors. Putting a TV over a credenza is the best idea. Putting it over the mantel means having to watch with your neck in an unnatural position (unless you’re a giraffe). That could lead to neck problems. Ask me how I know. I like the ideas you’ve shown. Have you ever looked into making your television look like a mirror? It could look nice in your breakfast room. I am hoping to utilize a two-way mirror to hide our mounted television as I don’t like looking at a television either. You can find the old school maps on Ebay. I’ve been wanting one for a while. In all those photos I only saw one sound bar. Odd. The new tvs definitely require a separate sound system. So don’t forget to leave room for that. I tend to lean toward cottage design, so my favorite has always been painted wooden shutters that fold just like your pictures do. I’d hang a small decorative wreath on each of the middle shutters.